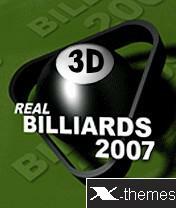 Description: Logical sequel of Real Billiards series – completely 3D and realistic billiards for mobile phones. Now you will not have any doubt that you play real billiards – because you can turn table as you want, and active game cameras will film every your blow, making your game look as if it was a movie. Now you will choose not only the angle of a blow, but also the point of your watching at the table; you will enjoy beautiful iterations from different angles and get pleasure of tournaments with friends and electronic opponents. is it true dat d language is not eng.? i want 2 get this game.. al games.. I hope it is real fun game. I saw it on a mobile and it was just terrific. Thanks in advance.